Which is the Fastest Electric Scooters in 2019? Up until recently the electric scooters were notorious for being too slow. With those heavy SLA batteries, the 20mph was pretty much the maximum speed for electric scooters. But with new Lithium batteries came the improvement in capacity, the electronics got better and new e-scooters and electric mopeds got faster. Fast enough to compare to any vehicle on city streets. So which is the fastest electric scooter you can buy in 2019? Speed record on electric vehicle with two wheels was set by Paul Thede on The Lightning Motorcycles SuperBike, which managed to reach the speed of whooping 218 mph. Now, we are definitely not looking for that amount of speed in our scooters. It would probably be very unsafe to go crazy fast on an e-scooter. So we decided to put the record-setting prototypes aside, and focus on the production models that can go over 20mph. Although speed should not be the only thing to consider when buying electric scooter it is nice to know that you can speed up to 35 mph when you need to, especially if you happen to ride your electric scooter on city roads alongside cars and gas scooters. If you need a lightweight portable urban scooter, you go to Xiaomi. If you need a crazy powerful electric scooter with a riding experience of a full size moped or motorcycle, you go to Minimotors. Dualtron Thunder is definitely one of the most powerful electric scooter currently available. Two BLDC hub motors with combined power of 5400W mean that one you push the throttle there is no stopping. We would dare to say that Dualtron Thunder is a true monster machine built to go at insane speeds and conquer the roughest terrain. Maximum speed is 45 mph, which you should be able to achieve with a slight modification, as it comes limited to 15mph out of the box. This scooter provides the levels of road safety and stability that is just unheard of in today’s mass production electric scooters, featuring hydraulic brakes and ABS and the suspension that is a true innovation. The 45 steps control suspension system consists of 3 steps motor axis distance control, 3 steps arm angle control, and 5 types of the rubber, meaning that there are 45 options (3 x 3 x 5) of the adjustment of the suspension strength. Cables are fully shielded against any exterior hazards with the additional pieces of rubber sealing the cable entrances to the main body, and also every bolt thread sealed. If you are looking for the fastest electric scooter of all, that can give you adrenalin-charged ride, and make you go weak at the knees, the NanRobot LS7 might be the one. The power of this scooter is enormous – two independent brushless high speed motors, 1800W each, giving enough power to get you blazing to speeds close to 50mph, enough torque to climb hills and enough battery capacity to last for 56 miles. NanRobot LS7 looks very much like Dualtron II. The two have very similar technical specifications and the list of features looks pretty close. Dualtron does look more robustly-built, but NanRobot LS7 does pack up some serious power. The maximum weight this scooter can haul is 330lbs, and the weight of the scooter itself is about 84lbs. This is not your average commuter scooter. This is a monster machine with two motors, dual suspension, full front and rear rubber suspension able to handle all sorts of rough terrain. Before riding, be sure to wear a full face helmet covering your whole the face, protective gloves, as well as knee elbow pads. Qiewa is a Taiwanese manufacturer of electric scooters that you probably never heard of before, but their heavy-duty folding electric scooters can go 35 mph easily. The scooter itself looks pretty sturdy. Even though it’s a standup scooter is has plenty of features that make it road-ready: front and rear suspension, front and rear disc brakes, headlights, taillights, side lights, horn and alarm system with keyless entry remote. You also have an option to buy a removable seat for this scooter. 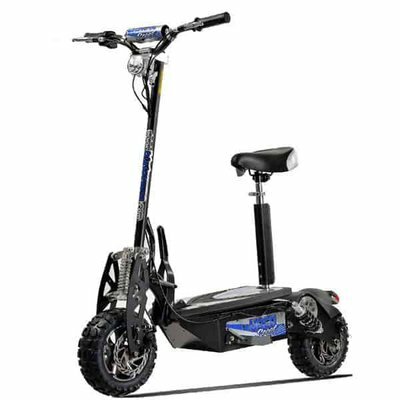 With the 800W motor and 10” pneumatic tires, this is actually a pretty powerful all-terrain scooter that can easily conquer any road. The advertised range is about 60 miles, but is probably under the ideal circumstances and with no rider on it, so you should expect a lot less. The chassis is made from high-strength aluminum and the scooter is also labeled IP6Waterproof. All in all this fast e-scooter, sold in Taiwan under name of Q1 Blitz Hummer, is a very nice, very stable ride that can be easily folded and put in the trunk of your car. NanRobot D4+ is a scooter to watch this year. It is propelled by two independent 1000W motors built in the front and rear wheel, which allow for a top speed of 40 mph. You can choose between single and dual motor drive, as well as eco mode for saving battery or turbo mode for maximum torque. Maximum range you can expect to get out of the high capacity 52V 23Ah lithium battery is 45 miles. Wheels are equipped with 10” pneumatic tires, front and rear disc brakes, and also 6 shock absorbers – 4 on the front and 2 on the rear wheel. This is an all-round electric scooter; not only does it offer awesome performance and comfortable ride, it also has an impressive set of features. It’s got an LCD display that details speed, drive mode, and battery life. It is foldable, you can easily collapse the handlebar, and take it with you in the trunk of your car. You will probably not be able to carry it around, as it weighs around 60lbs, but you can pick it up and carry up couple of stairs if you need to. Other features include lights on the front and rear to make the ride safer, and a USB charging port. The UberScoot 1600 is one of the most powerful electric scooters ever being sold. Powered by 48 volts SLA battery and a 1600 watt motor, this beast of an electric scooter is not a toy. It can go over any terrain and climb very steep hills. It even looks like a dirt bike with its 12” knobby tires. The scooter is designed for heavy duty users, so it comes with a compact lock-down/up folding system that allows easy storage and transportation. It features an economy mode button that can be used to slow down acceleration and top speed to conserve the battery life for long rides. The scooter has front and rear lights so it can be used even at night. Designed and manufactured by Evo Powerboard, UberScoot boasts the top speed of 30mph and range of 12 miles with stock setup. To double the range you can upgrade this scooter with Lithium battery pack, which is not complicated at all, but it’s expensive. If you have some extra money, you should do it, because it is well worth the investment. This simple upgrade will make your scooter lighter, which will add to its agility, increasing the top speed to close to 40mph, which makes it (potentially) the fastest electric scooter on our list. It will also cut the charging time in half. The Uberscoot 1600w has an adjustable, padded seat for added comfort during your ride which is included in the price. Note: The UberScoot 1600w has been discontinued from the UberScoot store, but this model is still available on Amazon. Doohan iTank 2.0 (also sold as Goodyear eGo2) is a Chinese brand of scooter, that stands out from the crowd for its funky styling, that might not appeal to everyone. One thing is for sure – you won’t go unnoticed riding this scooter. Powered by 1500W Bosch hub-drive electric motor, with reverse mode. With 28Ah 60V Li-Ion battery the advertised range of this scooter is 70 miles, however 50 miles on a full charge is probably more realistic to expect. There is space for a second battery, so you could theoretically double the range. The reason we put Doohan iTank on our list is the top speed of 28 mph, with the real ability to climb hills at 20mph, which is pretty impressive. It accelerates amazingly, reaching the top speed of 28mph in under 5 seconds! Twin front wheels improve wet grip and braking, while the unique three wheel design gives you an improved stability, great handling and smooth turns. The reverse comes in handy, as iTank has a poor turning radius. All in all this is an all-purpose electric scooter, powerful, and unlike anything else, and the only thing that would possibly turn you off this scooter is the price, which is a bit on the higher side. However if you consider that you are getting an actual vehicle. plus calculate all the money you would save on gas, it does seem like a good deal. Top speed depends on many factors, and the two most prevailing ones are the rider’s weight and the terrain. Even the most powerful e-scooter on this list will not reach its top speed when hauling a 260lbs rider uphill. But if you are average weight you can go pretty fast on flat ground. Of course, you should always wear helmet and other protection gear when riding a scooter, especially if you are going that fast. Electric scooters are real vehicles, not toys. DISCLAIMER: We have made this list based on the top speeds that these scooters can reach, some of them with small modifications. We are not saying you should ride them at that speed, or that you should make any kind of modification on your scooter. In fact, legal limit for scooters that do not require license or registration is 20mph in most states, and any kind of tampering with your scooter will void the warranty.